Custom Embroidery Golf Towels in Bulk. Tri-Fold, with Grommet and Hook. Cheap, Promotional. Budget Prices for USA, Canada. White, Black, Forest Green, Navy or Red. Large: 16" x 25". Bulk embroidered cotton golf towels, folded (tri-fold) or unfolded: same price. We also supply blank (not embroidered) golf towels in bulk. 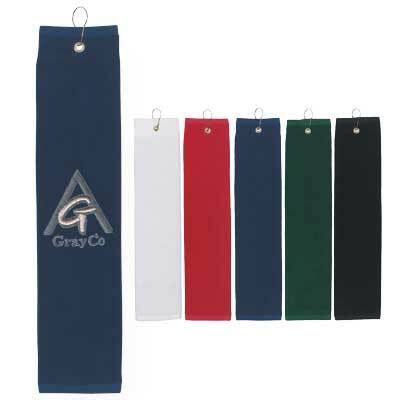 Lowest prices in USA and Canada for wholesale Embroidered Golf Towels. American clients pay no taxes.